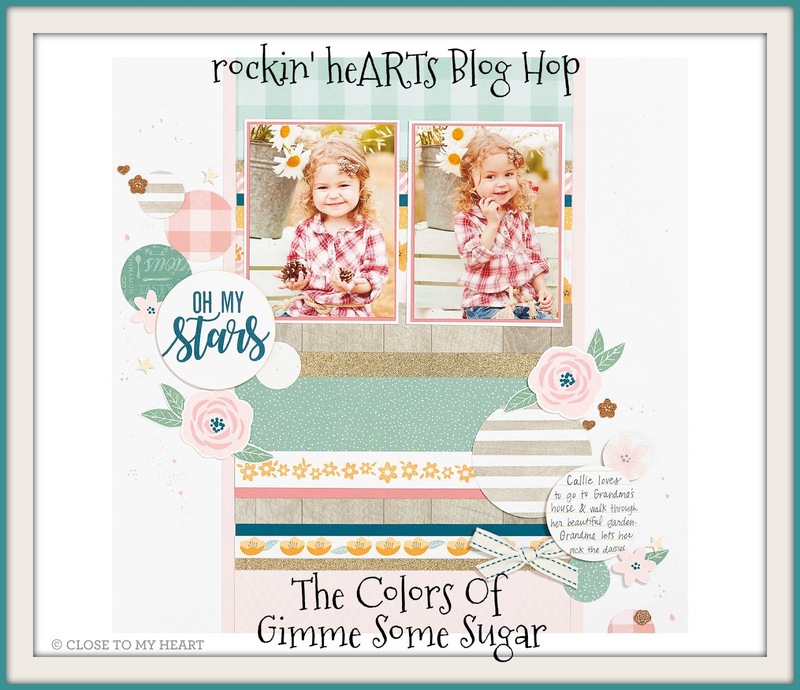 Welcome to the rockin' heART's blog hop! This month we are featuring The Colors of Gimme Some Sugar, Juniper, Bashful, Linen, and Tangerine! What a beautiful Spring bouquet that would make! If you have hopped from Kim's blog, you are on the right track. You will find a list of all rockin' heARTist blogs below. My project is kind of special as it is my announcing that I have a fifth grandbaby on the way!! I am too excited!! I used the pieced and stitched heart from a recent Close To My Heart Facebook page post to create the center heart. Gimme Some Sugar colors Linen, Tangerine, Bashful, Juniper and a little Peacock make up the heart sections. Not knowing whether we are having a girl or boy, I felt this color scheme could work for either. 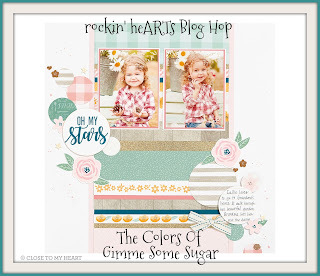 Now it is time to hop on over to Amber's blog to see what beautiful project she has created for us! Here are the rockin' heARTists participating in this month's hop! If you see something you like and you don't have a Close To My Heart consultant, I would love to serve you, click HERE to see more! Or if you would like to JOIN the rockin' heARTs, please contact me. Very pretty. love how you did the trim on the sections in the heart. And I like the border. Very nicely done. Congrats on grand baby #5. Love your layout it makes a great announcement.